How many sea horses can I keep in my aquarium? That seemingly innocuous question is the first thing almost every new sea horse keeper wants to know, and rightly so, since it is one of the keys to success. It’s a very simple question, yet exceedingly difficult to answer, since the proper stocking density for any setup depends on a great many complex factors. How big is the aquarium and how efficient is the filtration system? What species do you want to keep in it? Are you going with captive-bred sea horses (CB) or are you going to roll the dice and try your luck with wild caught (WC)? Will the inhabitants be juveniles or adults? How big will they be at maturity and what’s the maximum size they reach? Do you intend to breed them or do you just want to keep a herd of happy ‘horses? Do they form lasting pair bonds or are they nonmonogamous? Is this your first attempt at keeping sea horses or are you an old salt with loads of experience breeding and rearing various species? Since success or failure can hinge on these crucial issues, this column will discuss the factors that determine how many sea horses an aquarium can hold, delve into some of the common mistakes aquarists make when stocking their stables, and explain some of the early indicators of overcrowding that can alert the sea horse rancher that his corral may be over stocked. We will then provide some general guidelines as to the holding capacity of various setups and offer suggestions on stocking an aquarium dedicated to sea horses. For instance, the experience level of the hobbyist certainly has a bearing on how many sea horses he should attempt to keep in a given volume of water. If you’re a rank beginner, you will be better off keeping your stable under stocked in order to provide a margin of error while you learn the ropes with these amazing aquatic equines. Savvy sea horse pros who’ve seen it all before and know all the tricks and trouble spots, on the other hand, can afford to push the envelope a bit and keep their herds near capacity. Likewise, the filtration system obviously affects the number of specimens a certain aquarium can support, yet it is often overlooked when stocking densities are discussed. Consider two identical 25-gallon (tall) tanks: one relies on under-gravels and/or foam filters, perhaps supplemented by a small external, hang-on-the-back filter packed with media such as activated carbon; the other features plenty of live rock and perhaps even a live sand bed, supplemented with a good protein skimmer. The first simple setup has an adequate bio-filter but is something of a nitrate factory, whereas the more sophisticated setup has significant dentrification ability in addition to plenty of bio-filtration. Both systems have the right dimensions and sufficient water volume to support several large sea horses, but you don’t need to be a marine biologist to understand that the live rock setup with the skimmer can handle a greater bio-load and safely house more specimens than the more basic system. Ideally, it’s also a good idea to provide monogamous species, such as Hippocampus reidi and H. comes, with more space than sea horses with promiscuous mating systems. The normal social unit for monogamous sea horses is the mated pair, rather than the “herd.” Pair-bonded sea horses are unaccustomed to the presence of strange adults other than their mates, and when they are crowded together in the aquarium, they may display heightened levels of aggression toward potential rivals upon finding themselves in the uncharacteristic position of having to compete for mates. Monogamy may breakdown altogether under such unnatural circumstances, and pair-bonded sea horses may have difficulty adapting to a situation in which rivals are always nearby, ever underfoot, continually within courting distance of their partners. For this reason, pair-bonded sea horses often do better when maintained by themselves or with other established pairs, rather than being thrown back into the mix with eligible bachelors and unpaired females in search of mates. Polygamous species such as Potbellies (Hippocampus abdominalis), however, tend to congregate in loose assemblages in the wild and often thrive under relatively crowded conditions, provided their tank is sufficiently tall and good water quality can be maintained. Potbellied Sea horses will be happy when maintained in mixed groups. Perhaps the most common mistake sea horse keepers make when considering the appropriate stocking density for their systems is failing to distinguish between wild-caught and captive-bred sea horses. Enough field work and research has now been done to conclude that, in terms of their behavior and need for elbow room, sea horses in the wild are very different animals from captive-bred and raised sea horses. For example, field studies show that pair-bonded sea horses typically enjoy a large territory in the wild (100 square meters in the case of female Hippocampus whitei, a fairly small Australian species that has been studied closely), and with their patchy distribution pattern, these sea horses only infrequently come in contact with others of their kind. Traumatic capture techniques, mishandling, and lack of feeding opportunities often plague wild-caught sea horses during transport and holding, and by the time they finally arrive at your local dealer’s, chances are great that wild ponies have already endured quite an ordeal. Malnutrition and stress at a time of high metabolic demand are likely to have weakened them. When confined in an aquarium, therefore, wild caught horses do not tolerate crowding well, and given their low disease resistance compared to their captive-bred brethren, it is NEVER a good idea to crowd wild-caught sea horses. They often have a more difficult time acclimating to life in captivity and will therefore be stressed, at least initially. Ocean Riders, on the other hand, are raised at far greater population densities than any sea horse experiences in the wild. Born and bred for aquarium life, they are far more social than wild caughts and are used to living in close proximity to each other. For them, that’s their normal condition and the aquarium is their natural environment. They reach the hobbyist well fed, in peak condition, and already accustomed to aquarium life and frozen foods. As a result, Ocean Rider sea horses are simply hardier, more disease resistant, and tolerate crowding and life in captivity far better than their wild-caught counterparts. Suffice it to say that more captive-bred sea horses can be maintained in an aquarium of a given size than wild-caught ‘horses. Quantifying all of this, and specifying a certain number of sea horses per so many gallons of water, is a very tricky proposition because so many factors like those described above must be weighed. Consequently, my recommendations for stocking density include a range for each size of aquarium in order to accommodate variables such as differing filtration systems, whether the sea horses are wild or captive bred, and varying levels of expertise. If you’re new to sea horses or have a basic setup that relies on regular partial water changes to control nitrates, you will need to stick to the lower end of the recommended range when stocking your stable. However, if you’re an experienced reefer or an old hand at sea horse wrangling, with a relatively sophisticated system at your disposal, feel free to explore the upper limits of the suggested stocking densities. Likewise, if you’re interested in a monogamous species, try to adhere to the lower limits; if you favor a promiscuous species, you can confidently keep them in the larger groups suggested for sea horses of their size. And, of course, the stocking chart below includes separate columns and recommendations for wild-caught and captive-bred sea horses. The sea horses listed in the table below are limited to those species that are commonly available to hobbyists, either through captive-breeding programs or via wild-procurement. In most cases, the information on stocking densities may be extrapolated and applied to other species that were not included in the tables simply by comparing them to sea horses of comparable size that are listed. However, although there are other pygmy ponies that fall into the *Dwarf category in terms of their size (H. bargibanti, H. lichtensteinii, H. minotaur), the stocking densities for Dwarf Sea Horses are based solely on Hippocampus zosterae and must NOT be applied to other miniature sea horses. The dwarf sea horse, H. zosterae is unique among sea horses in its sociability and tolerance for crowding. In fact, dwarves do best when kept in groups, and many breeders recommend keeping a minimum of 5 pairs together in order to assure reproductive success. Dwarf sea horses are as prolific as they are promiscuous in captivity. Far from inhibiting courtship, crowding seems to stimulate breeding in zosterae, almost as if they reach “critical mass” at a certain population density, triggering a chain reaction of mating attempts. Thus, provided water quality can be maintained, “the more the merrier” appears to be the rule with this species. For instance, pet dealers must occasionally crowd large numbers of fish together in cramped quarters due to a lack of space, including dwarf sea horses. Robert Straughan was once forced to keep 300 H. zosterae in a 10-gallon tank in such a situation, and was pleasantly surprised to find that over 100 of them managed to pair up and mate nonetheless. He reported that at any given moment, dozens of dwarves were actively engaged in courtship, so it was a common sight to witness several couples rising simultaneously to exchange eggs, and that one or more of the gravid males would be delivering young virtually around the clock. Keep this in mind when studying the recommendations for dwarf sea horses in this table. *The table above is based largely on Chris Burn’s “educated approximations” from his article “Sea Horse Stocking Levels,” which originally appeared in the February 2001 issue of FAMA Magazine. My contribution has been primarily to add information on stocking densities for wild-caught vs. captive-bred sea horses in every category, to tweak the numbers based on my own experience and observations, and to add the classification of “Giant” to the chart to reflect the recent availability of captive-bred Hippocampus abdominalis and Hippocampus ingens, both of which can reach 35 cm or 14 inches in total length. Hobbyists have a tendency to overcrowd sea horses because they are relatively inactive fishes that do not require a great deal of swimming space and because they are gentle, peaceful creatures that readily accept, and even enjoy, the presence of other sea horses. Unlike wrasses, buttefly-fishes, and tangs that swim tirelessly back and forth all day, the humble Hippocampine is a relatively feeble swimmer that prefers to spend most of its time clinging to a favorite hitching post. As ambush predators that hunt from concealment and wait for their prey to come to them, and which rely on camouflage and their ability to remain motionless in order to escape detection and stay out of trouble, this sedentary lifestyle serves sea horses well. Unfortunately, it often leads aquarists to underestimate the amount of space they need. Thus it is not surprising that one of the most common mistakes inexperienced aquarists make with sea horses is keeping them in cramped quarters. After all, a ten-gallon aquarium housing several 6-inch sea horses does not appear overcrowded based on the overall activity level and behavior of the inhabitants. The sea horses are not swimming agitatedly about, banging restlessly against the glass, nor are any tooth-and-nail turf wars taking place, as each of the residents tries to claw out a chunk of real estate it can defend against all comers. But appearances are deceiving, and that 10-gallon tank is dangerously overcrowded, far exceeding its long-term carrying capacity. For starters, a standard 10-gallon aquarium is way too shallow for sea horses of that size, precluding the possibility of breeding and leaving the ‘horses vulnerable to depth-related conditions such as Gas Bubble Disease (GBD). But the primary problem is that maintaining adequate water quality in a crowded set-up with such a limited volume of water will rapidly become a losing battle. Sea horses feed more or less continuously throughout the daylight hours in the wild, and in captivity they need large quantities of enriched foods on a daily basis, naturally producing correspondingly large amounts of wastes. Consequently, in a relatively small, crowded tank, you can expect to see transitory ammonia/nitrite spikes following every feeding and a steady buildup of nitrate to unhealthy levels over time. Needless to say, this is a stressful environment for the sea horses, and it’s only a matter of time before disease takes its toll in such a setup. Even the most experienced hobbyists can be led astray by the gentle nature of these easygoing animals. Although seasoned sea horse keepers usually have systems of suitable size, they are by no means immune to the “just one more” syndrome that afflicts most marine aquarists. Whereas territorial fish such as damsels, angels, and triggers will let the aquarist know when a newcomer has disrupted the harmony of their community in no uncertain terms, no such murder and mayhem erupts when one too many new additions is made to the sea horse tank. On the contrary, the new arrivals often seem to be more than welcome, triggering a flurry of greetings and renewed courtship displays as the ‘horses reassess their shifting social dynamics and bachelors and bachelorettes size up prospective new mates. The temptation to add another pair of sea horses to the herd is therefore often all but irresistible. And depending on how under stocked the ol’ corral may be to begin with, the hobbyist often gets away with it the first time or two. But sooner or later, the sea horse setup reaches its carrying capacity, and after that point, the next addition(s) can trigger a cascade of catastrophic events. When that happens, you will typically have a situation where a previously stable, trouble-free system that had been thriving for many months or even years suddenly develops a series of nagging problems. Often this starts with relatively harmless developments-maybe one of the ‘horse’s appetite drops off, or general activity levels are down, or the hobbyist suddenly realizes he hasn’t seen any courtship or breeding for a while-that quickly escalate to real trouble. Many times, things just seem a little “off” at first, but there’s nothing you can quite put your finger on, nothing you can point to as a specific problem. A routine check of the usual aquarium parameters at this stage frequently fails to reveal anything amiss, for what’s happening at first are more subtle changes: a gradual drop in dissolved oxygen levels, pH fluctuations and temporary ammonia/nitrite spikes following a heavy feeding, a persistent rise in nitrate levels. The sorts of things that accompany a slow build up of detritus and the gradual accumulation of excess organics in the substrate and the filter media. The sorts of things that are difficult for even a diligent hobbyist to detect, short of continuously monitoring ORP levels. The sorts of things that are inevitable whenever the bio-load exceeds the carrying capacity of the aquarium. The sorts of the things that subject sea horses to prolonged, low-level stress, which weakens their immune systems. The sorts of things that, sooner or later, result in disease problems. Beware when unusual disease symptoms suddenly begin to crop up in a previously healthy herd a few days or weeks after new specimens have been introduced to the aquarium. Look for unusual afflictions and odd ailments like “weak snick” and “trigger lock,” or rapid respiration in an otherwise healthy animal, or the first signs of snout rot: all early indications of masked protozoan parasite infections. These organisms are ubiquitous in the aquarium; healthy sea horses resist them easily, but stressed animals with impaired immune systems are susceptible. The parasites typically attack the gills initially, from which they spread to the throat and mouth. As their numbers build up in the gills and they spread from within, invading the esophagus and oral cavity, symptoms such as rapid breathing, loss of appetite, weak snick, trigger lock, and snout rot begin to appear. And be on the lookout for the appearance of GBD, not in all of the ‘horses, but in one or two specimens-especially if the first telltale bubbles (subcutaneous emphysema) appear under the skin of the tail or snout of the sea horses. This is an unusual form of GBD that appears to be associated with a bacteria-laden substrate and which afflicts females as readily as males; ‘horses with impaired immunity may develop the blister-like bubbles on their tails or snouts-the only parts of their anatomy with which sea horses normally contact their immediate environment. If the alert aquarist catches these early symptoms of overcrowding and takes appropriate measures to correct the situation, a happy outcome is still possible and no specimens need be lost. All affected specimens should be immediately removed to a hospital tank for treatment based on their symptoms. The appropriate remedies can then be safely administered in the treatment tank without affecting the display tank, and removing the afflicted individuals may well reduce the population in the main aquarium to acceptable levels, alleviating the problem for the rest of the herd. If the main exhibit does require treatment, hyposalinity or osmotic shock therapy can then be used to eliminate protozoan parasites from the system without further stressing the herd or disrupting bio-filtration. But by the time the telltale symptoms appear, the overloaded system is perilously close to a crash. If the hobbyist fails to recognize the problem and does nothing-or worse yet, decides to treat the whole aquarium with a shotgun approach, nuking his tank with broad spectrum anti-bacterials/anti-parasitics which could further impair the bio-filter-then Mother Nature will correct the situation for you and restore equilibrium the old fashioned way, with a massive, sudden die off. The weakened specimens will be weeded out, reducing the bio-load enough to shift the balance back in favor of the hardier survivors. This disastrous development often leaves the hapless hobbyists baffled and bewildered, confused as to what caused the crash in the first place and completely clueless as to why things suddenly reverted back to normal. All he knows is that his tried-and-true system had been running trouble-free for a prolonged period of time, was suddenly hit with a massive, mysterious die off for no apparent reason, and then just as suddenly and inexplicably, his sea horses stopped dying. To the best of his recollection, he did nothing differently either beforehand to cause the calamity or to correct conditions afterwards. Rarely does he realize that overcrowding upset the equilibrium of his setup, and that the root of the problem can be traced directly back to the new additions to his herd he made weeks ago. He may even unwittingly repeat the same mistake when he restocks his depleted stable. There is one last, very common, mistake aquarists make when stocking their stables I must point out, and that is mixing wild-caught sea horses with captive-bred specimens. That’s a simple error that often trips up the rawest greenhorns and most seasoned veterans alike. It’s quite a common practice, but a very bad idea for a couple of very good reasons. To begin with, it automatically reduces the stocking capacity of your system to the lower level appropriate for wild-caught sea horses regardless of the ratio between WC and CB, and that reduces your safety margin accordingly. It doesn’t matter if you have only one ocean-born bronco among many captive-bred ‘horses-the herd is only as strong as its weakest link. If one of the sea horses is stressed at your current stocking levels, it’s quite irrelevant that the rest of its tank-mates are perfectly contented under those same conditions-that stress-weakened individual will be susceptible to disease, and if it succumbs, all of its tank-mates will be exposed to whatever it contracts and be placed at risk. Secondly, by the time they reach the hobbyist, WC sea horses have run the gauntlet from collector-to-wholesaler-to-retailer, which means they have been exposed to all manner of parasites and pathogens at every stop along the way. All of those facilities feature holding tanks that share common water supplies and house fish from all over the world, so during their stay at those holding systems, WC ‘horses are exposed to a long list of dangerous microorganisms at the very time when their immunity is lowest. That makes wild-caught sea horses potential disease vectors for everything you can imagine, and when you introduce WC ponies into to your sea horse setup, you are introducing your entire herd to whatever the wild caughts have been exposed to as well. Now, Ocean Riders are remarkably hardy, disease-resistant animals, and chances are your captive-bred sea horses won’t suffer any immediate ill effects from such exposure. But once they gain a foothold, many pathogens and parasites are extremely difficult to eradicate from your system, and will persist at low levels thereafter, a dormant disease reservoir that will pose a lingering menace to your tank, like a ticking time bomb, ready to explode and take its deadly toll the next time any sort of stress lowers the resistance of the herd. 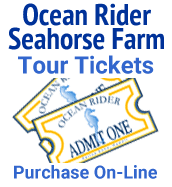 One of the advantages of obtaining captive-bred sea horses from Ocean Rider is that they come to the aquarist direct from the aquaculture facility, without any middle-men or inexperienced sea horse handlers being involved. ORs are thus not subject to stops at a collector’s holding facility followed by a stop at a wholesaler and an indefinite stay at a retailer before they finally reach the hobbyist. More importantly, they are not subject to traumatic capture methods, mishandling, or abuse-or exposed to countless diseases en route to the consumer-and therefore arrive at your door in top condition and disease free. Aside from their inherent hardiness, hobbyists need not worry about Ocean Riders developing many of the common diseases that plague other sea horses because those parasites/pathogens are not present in the first place, unless they are brought into the aquarium with wild-caught fishes introduced as tank-mates or via live foods. In conclusion, I would like to offer these final words of advice: if your sea horse setup has been running smoothly and trouble-free for a prolonged period at it’s present level of occupancy, try to resist the temptation to increase your herd. Why risk upsetting the balance in a system that has settled into a state of happy equilibrium? If you have any doubt as to whether or not your system is running at capacity, err on the side of caution. Rather than risk overcrowding an established tank, consider starting up a new aquarium when the urge to acquire some new specimens becomes overwhelming. Target feed your sea horses and remove any uneaten frozen foods immediately after every meal. Following these recommendations will provide you with a comfortable margin for error while you gain experience, and greatly improve your odds of success. After looking into sea horse accommodations, I’ve learned one very enduring, yet often unappreciated fact-overcrowding remains a long lasting threat in most exhibits!